to play in the annual All-Star game. LOGAN, Utah - For the fourth time in the last five years, Utah State has a football player selected to participate in the Senior Bowl as Tyler Larsen has accepted an invitation to play in the annual All-Star game. The 65th Senior Bowl will be played on Saturday, Jan. 25, 2014 at Ladd-Peebles Stadium in Mobile, Ala. All practices during the week and the actual game will be televised on the NFL Network (Comcast Ch. 180, Dish Network Ch. 154, DirectTV Ch. 212). Overall, Larsen is the 18th Utah State player selected to the Senior Bowl since 1962 and the fourth in the past five years as cornerback Will Davis played in 2013 game and recorded an interception, while linebacker Bobby Wagner was named the North's Most Outstanding Player in 2012, and defensive backCurtis Marsh was selected in 2010. Larsen, a 6-4, 312-pound senior offensive center from Salt Lake City, Utah (Jordan HS), was named a second-team All-American by USA Today Sports during his senior season to become just the 12th player in school history to be named a first or second team All-American, including just the third offensive lineman. 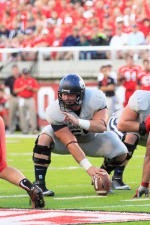 Larsen was also one of six finalists for the Rimington Trophy in 2013, which is presented annually to the most outstanding center in college football, and became just the ninth player in school history to be a three-time first-team all-conference selection after earning first-team all-Mountain West honors as a senior. During his senior season in 2013, Larsen started all 14 games at center and led the team with an overall performance grade of 89 percent, including 82 percent in technique and 91 percent in effort. He carried out the right assignment 98 percent of the time, including seven games where he graded out at a perfect 100 percent. He also graded out above 90 percent nine times in total performance and above 85 percent 12 times in effort and above 80 percent nine times in technique. Larsen finished the season with 56.5 knockdowns. Larsen finished his Utah State career starting 52 consecutive games, which is a school record, and ranks third in the nation among active players. Larsen was also part of the winningest class in school history with 31 victories. The Senior Bowl is college football's premier senior showcase event, annually featuring the nation's best senior collegiate football stars and top NFL draft prospects on teams coached by NFL coaching staffs. All Senior Bowl practices and game week festivities are attended by more than 800 general managers, head coaches, assistant coaches, scouts and other front office personnel from all 32 NFL teams, making Mobile and the Senior Bowl the week-long host to a one-of-a-kind NFL Coaches Convention. Utah State concluded the 2013 season with a 21-14 win against 24th-ranked Northern Illinois in the San Diego County Credit Union Poinsettia Bowl to finish the year with a 9-5 record and tie the 1960 and 1961 teams for the second-most wins in school history. With its win against Northern Illinois, Utah State posted back-to-back bowl wins for the first time in school history as it played in its third-straight bowl game, also a first at USU. Utah State, who finished the 2013 season by winning six of its final seven games, also set the school record for conference wins as it posted a 7-1 league mark in its first season in the Mountain West to win the Mountain Division of the conference and advance to the inaugural Mountain West Championship game. Utah State ended the year ranking tied for 37th nationally in both the Associated Press and ESPN/USA Today Coaches' polls with two votes each, marking the second time in as many years that USU has concluded the season ranked among the top teams in the nation as the 2012 team was ranked 16th in the final AP poll, 17th in the final coaches' poll and 22nd in the final Bowl Championship Series (BCS) standings.